Whether a painting came from the hand of one of the Old Masters or is merely a copy made by a disciple will determine whether the work is exhibited in museums for centuries for the entire world to enjoy, or end up hidden away in a minor collector’s posh apartment. Appraising art is a difficult task, especially when a work is hundreds of years old. Despite amazing new scientific appraisal methods, sometimes, without clear provenance showing the history of the paintings ownership, there is just no way to be sure if a work is authentic. Such is the case in a controversy that ended in a UK Court this week in which Sotheby’s was vindicated over a claim that the auction House negligently misidentified a painting as not being a Caravaggio, but instead painted by a follower of the Baroque artist. The difference between the work being a Caravaggio and not is about $15 million. Michelangelo Merisi da Caravaggio was an Italian artist active in Rome, Naples, Malta and Sicily between 1593 and 1610 ad is considered one of the greatest artists of the Baroque school. Caravaggio was enigmatic but also considered rebellious and dangerous. At one point, he was the most influential artist in Rome, although later he had to flee into exile after killing a man in a brawl, only to die a year later under suspicious circumstances. Caravaggio heavily influenced artists such as Rubens and Rembrandt. Caravaggio’s painting, “The Cardsharps” depicts two hustlers trying to cheat another man in a card game. The known original hangs at the Kimbell Art Museum in Fort Worth, Texas. U.K. Royal Navy Surgeon Captain William Glossop Thwaytes purchased this version of the painting in 1962 for £219 or about $5000 in today’s currency. In 2006, his heir Lancelot William Thwaytes consigned the painting to Sotheby’s London. After a review of the painting by specialists in Sotheby’s Old Masters Painting Department (OMP), the OMP unanimously decided the work was not by Caravaggio. The painting went up for auction and sold for £42,000 ($63,700), to Orietta Adam, a friend and partner of Sir Denis Mahon, the world’s foremost expert on Caravaggio (Mahon identified Caravaggio’s The Taking of Christ, known as the lost Caravaggio, which is the subject of the 2005 non-fiction book The Lost Painting). After the 2006 sale, Ms. Adam, cleaned and restored the piece. Mahon, believing it to be an authentic Caravaggio, brought in scholars to help authenticate the painting. A year later, at his 97th birthday party, Mahon proudly unveiled the work and proclaimed it to be an original Caravaggio dating to 1595 and worth £10 million ($15.8 million). After Mahon’s death the painting was placed on loan to the Museum of the Order of St John at Clerkenwell in London and insured for £10 million. Mr. Thwaytes, obviously upset with Sotheby’s over the supposed misattribution, sued Sotheby’s, saying that Sotheby’s OMP was negligent, giving him improper advice about the painting’s worth. Thwaytes accused the auction house of not consulting enough experts and not putting the painting through the proper tests to eliminate the possibility that the work was not an authentic Caravaggio. Sotheby’s says that its “view that the painting is a copy and not an autograph work by Caravaggio is supported by the eminent Caravaggio scholar Richard Spear, as well as by several other leading experts in the field”. Other experts who have gone on the record in support of Sotheby’s view include Helen Langdon, the Italian Baroque scholar and the writer of Caravaggio’s 1998 biography, and Sebastian Schütze, a professor of art history at the University of Vienna. In reference to Mahon’s The Cardsharps, Schütze writes in his 2009 catalogue of Caravaggio’s paintings that “the quality of the execution… rather suggests the painting to be a copy”. Although Thwaytes may try to appeal the case, at least for now, Sotheby’s is off the hook. However, that doesn’t mean that the experts at Sotheby’s were correct. The court ruling simply shows that Sotheby’s went through the proper procedures, and their experts had valid reasoning to declare that the work is not by Caravaggio. Many experts disagree with that assessment. Charles Beddington, a London art dealer who was formerly head of Christie’s International’s Old Masters paintings department, said that “Caravaggio is a particularly difficult artist. The quality of his execution is variable, and so he’s easy to copy.” In fact, authenticated works by Caravaggio rarely appear on the art market. No painting catalogued as being by the artist has appeared at auction this century. Why is Appraising the Old Masters so Difficult? It’s amazing how often scholars disagree on the authors of many works, particularly older ones where many records no longer exist. The lack of provenance left Thwayte to the mercy of an art market where supposed experts following methods that are often mysterious or seemingly arbitrary. May scholars are stubborn, resistant to new scientific methods or so concerned about their position in the art hierarchy that they become too cautious. The disagreement over authenticity leave works in limbo for years, hoping that one day there will be enough evidence or a change in thinking leading to the acceptance of a particular works authorship. As an example, take Martin Kemp’s decades long journey to prove a drawing of a young woman was the creation of Leonard Da Vinci. Several years ago, Kemp was asked to authenticate the drawing of a young girl. He found the telltale signs of Leonardo Da Vinci. 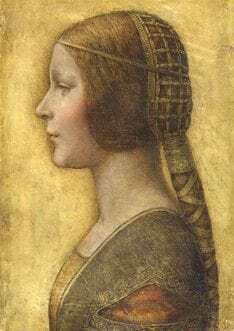 The drawing had been done with left-handed strokes; The artist liked to soften works with his palm, and this work had a palm imprint; the girl’s proportions adhered to the geometries found in Leonardo’s notebooks, among other signs. Many of the drawing’s pigments were analyzed along with radiocarbon dating of the parchment; all test indicating the materials were created during the period around Da Vinci’s lifetime. Later, Kemp researched the clothing and hairstyles, finding a match; more research suggested that the girl might be Bianca Sforza, the Duke of Milan’s illegitimate daughter who died in 1496 at the age of thirteen. Finally, incisions on the drawing’s vellum page suggested that it may have been removed from a Codex, During the Renaissance, volumes of verse, compiled on sheets of vellum, were often dedicated to a princess upon her marriage or death. Finally, in 2009, Kemp declared the work an authentic Da Vinci and gave it the name La Bella Principessa. Many important scholars agreed with his assessment. But many did not, most notably, Carmen Bambach, the curator of drawings at the Met, who is the most respected authority on the works of Da Vinci. Bambach had various reasons for not believing the work was genuine, including the fact that there are no examples of Da Vinci drawings on vellum. But in the end, the deciding factor was non-scientific, and arbitrary. Like Kemp, Bambach’s intuition was the final arbiter, concluding, “It does not look like a Leonardo.” Bambach’s influence prevailed, leaving Kemp with few options. Then, in 2011, Kemp tracked down the original Codex at the National Library in Warsaw Poland. Kemp found that there was a page clearly removed and the stitch-holes and vellum drawing matched as well as the physical characteristics of the remaining sheets. Even with this new evidence, detractors still remain although generally, the work is being accepted as authentic, with shows around the world. The drawing will be shown in Milan from April 23, 2015, through October 31, 2015. I’m an artist, not an appraiser, but two things ring false in the Cardsharps. The pattern of checking on the surface suggests the painter used different paints than Caravaggio. The handling of skin tone, chiarascuro, fabric, and background do not seem consistent with his other works. There is an ironic quality to the painting which seems insufficiently serious or sinister when taken in context of his entire oeuvre. Just an opinion, but all these factors cause one to wonder. Sothebys probably had it right.